All products are certified Kosher under Orthodox Rabbinical supervision. Order early! Your gift will be shipped to arrive just prior to the holiday. 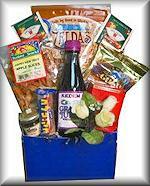 This tasty Rosh Hashana basket is the most economical basket yet!. Just a taste of apple and honey flavored treats. A bag of Honey Apple snack mix, dried apple chips, flavored coffee, crunchy peanut brittle, cinnamon apple flavored tea bag,a 1 oz jar of sweet honey, apple candy confection and a small Ghiradelli chocolate bar. A sweet way to start off the new year! A perfect gift for your Rosh Hashana Table. 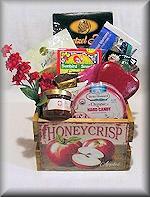 This Rosh Hashana Greetings Basket has an assortment of Apple & Honey based items. Apple tea, cookies, honey, and more. The silver basket adds elegance to your table. Rosh Hashana Toys Games & Fun for Kids ia a colorful bucket filled with an assortment for toys & games and a snack. This economical Rosh Hashana small box has honey, apple cookie, grape juice, dried fruit, gourmet flavored coffee, imported tea, apple confection. This new blue and silver Rosh Hashana basket has that comfy jean feel for the laid back people in your life. Apple cookies, honey, apple flavored hard candies, flavored coffee and tea, peanut butter filled pretzels and chocolate fill this cute metal basket. Shaped in the form of an apple, this wire apple basket for Rosh Hashana is filled with an assortment of delicious items. A small jar of honey, a bottle of grape juice, apple cookies, crunchy crackers, dried fruit and nut mix, sweet cinnamon and apple tea. 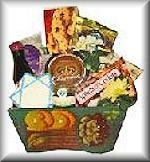 Looking for a cute Rosh Hashana gift basket for an affordable price? This new adorable apple themed wooden box has your holiday treats and it will not break the bank! Honey mustard pretzels, apple flavored dried fruit, flavored coffee, cinnamon apple tea, nuts, chocolate covered graham crackers, pomegranate and nectarine hard candy, and of course, honey and apple shaped cookie! All items in this Cholov Yisroel Rosh Hashana Gift Box are guaranteed to be Cholov Yisroel\Pas Yisroel. These Rosh Hashana treats are packed on a reusable plastic cake platter. Honey, Marzipan, Apple Cookie, Chocolate, Flavored Coffee, Imported tea & more. Send a Rosh Hashana gift box that is very versatile. Savor the apple cookies, honey, honey apple crunch mix, apple confections, flavored coffee, fudgee rolls, and more. The gift box can then be used over and over again to store mementos and photos! Add a moist honey cake for an extra sweet year! Brand New! Only for Rosh Hashana. A hand painted beautiful wood basket filled with Grape Juice, Pistachios, Chocolates, Applets Confection, Coffee, Apple Cookies & more. This Cholov Yisroel Rosh Hashana Apple Basket is just for Rosh Hashana. The oval metal basket has a picture of an Apple displayed on its side. Dried Fruit, Flavored Coffee, Pareve Caramel Corn, Honey, Israeli Cookies, Hand Made Shofar Cookie and more. All Pareve & Pas Yisroel. This Rosh Hashana medium basket comes with your High Holiday favorites: Honey, Rosh Hashana Custom Cookies, Grape Juice Coffee, Tea, Dried Fruit, and more. This tin has an elegant swirl design. Filled with our sweet holiday honey, crunchy apple cookie, dried fruit, nuts, flavored popcorn, crackers, Applet Confection & more. This basket makes a beautiful presentation. 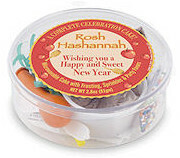 Say Happy New Year with a beautiful Rosh Hashana Tasty Tidbits basket filled with Grape Juice, Honey & Dipper, a chocolate spoon cookies, honey mints, Dried fruit, delicious chocolates, coffee and cookies. This Rosh Hashana Basketweave Basket is ONLY available Rosh Hashana. It is filled with apple cookies, Honey, Dried Apples, flavored pretzels, honey apple crunch and more. This beautiful basket says Happy New Year in a great way! Dedicated to helping support the Israeli economy. 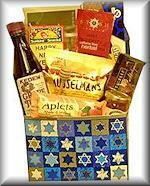 Proud to offer a basket that includes an assortment of imported Israeli goodies. This Large Rosh Hashana Israeli Basket has chocolates, sunflower seeds, cookies, tea, halva, Bamba snacks and of course honey and apple items to wish a sweet New Year. Looking for something really unique and beautiful? This Rosh Hashana Keepsake Box has both delicious New Year treats and is decorative and useful. Crunchy Walkers cookies, smoked salmon, flavored pistachios, colorful popcorn, Godiva chocolates, coffee, berry delights confections, and of course, Rosh Hashana themed items like honey and apple cookies. This is an apple & honey inspired basket. 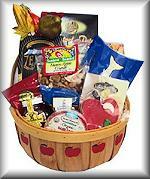 This Rosh Hashana Apple basket is filled with an assortment of Apple and honey themed items. Cookies, Honey, Aplets and Cotlets candy confections, honey mustard pretzels, Plump Pistachios, Dried Fruit, Smoked Salmon, Flavored Coffee, honey apple crunch mix, blood orange and honey hard candies, Imported Exotic Tea and more. This beautiful two tone wicker basket is filled with your Rosh Hashana favorites. The Rosh Hashana Royal basket has lots of Chocolates, sparkling grape juice, Flavored Coffee, Imported Exotic tea, dried fruits, plump pistachios and more. Add a sweet treat with our moist honey cake. 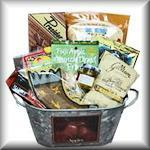 This beautiful Rosh Hashana Blue basket contains an assortment of Apple & Honey gourmet gifts. A large shofar cookie, 3 oz jar of honey, apple chips, cookies, dried fruit, flavored coffee, hot chocolate, chocolates, pistachios, honey mustard pretzels, and much more. 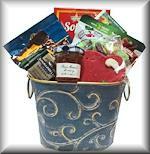 The beautiful blue wire basket can be used over and over again after the goodies are gone! This beautiful silver basket is filled with Rosh Hashana delicacies. Every Rosh Hashana Simply Elegant Basket is filled with Dried Fruit, Honey, dried fruits, Gourmet flavored Coffee, Imported exotic tea, plump pistachios, chocolates, fruit delights, Apple cookie and more. 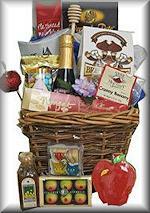 This Rosh Hashana Hostess gift basket is a beautiful presentation to your hostess. An elegant serving plate accompanied by your holiday treats. Honey, Apple cookie, dried fruit, plump pistachios, gourmet flavored coffee, exotic imported tea, chocolates & more. This Rosh Hashana Treasure Chest becomes a wine holder when you've eaten all the delicious treats. Filled with plump pistachios, apple cookies, honey, flavored coffee, exotic imported tea, cookies, chocolates, fruit delights, flavored pretzels and more. This large basket is filled with: Honey, Custom Created Rosh Hashana Cookies, Grape Juice, Flavored Coffee, Exotic Tea, Dried Fruit, Chocolates and much more. Looking for a gift that can has multiple uses? This new three (3) section gift basket has all your Rosh Hashana treats, packed in a strong woven 3 section basket that is very versatile! Loaded with cookies, flavored popcorn, honey mustard pretzels, smoked salmon, coffee, herbal tea, nuts, dried fruits, chocolates, fruit confections, pomegranate and nectarine hard candies, honey, apple cookies and an apple themed gift, this gift is guaranteed to amaze! 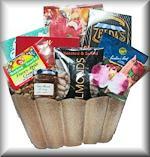 This unique Rosh Hashana Deluxe basket is filled with your favorite delights. Apple Cookie, Honey, colorful popcorn, Exotic imported Tea, Flavored Gourmet coffee, Dried fruit, smoked salmon, chocolates and more. 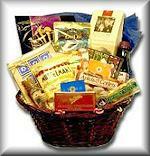 It just doesn't get any better than this Rosh Hashana Top of the Line Basket. For Rosh Hashana, honey, apple cookies, Mouthwatering Chocolates, Starbucks Coffee, Exotic Imported tea, dried fruits, apple preserves, Pistachios, caviar, tipsy onions, flavored popcorn and so much more. A chocolate or white cake makes this an elegant item for your Rosh Hashanah. Includes cake mix, frosting, sprinkles, and a balloon. Available in either Chocolate or White.